85% of our graduates are employed. 30% enjoy upward career mobility. 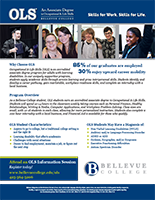 As a Bellevue College student, OLS students earn an accredited associate degree in Occupational & Life Skills. Students will spend 10-14 hours in the classroom weekly taking courses such as Personal Finance, Healthy Relationships, Writing & Media, Computer Applications, and Workplace Problem-Solving. Class sizes are small, with 12-16 students in each class, allowing for more personalized instruction. Students also complete a 200-hour internship with a local business, and Financial Aid is available to those who qualify. A practical degree. Occupational & Life Skills (OLS) is an accredited associate degree program for adults with learning disabilities. In our uniquely supportive program, students apply academic skills through service learning and grow interpersonal skills. Students identify and develop a career pathway, gain marketable, workplace-readiness skills, and complete an internship with a local business. The goal of the OLS program is for OLS students to become gainfully employed, contributing citizens. Skills for work. OLS creates a guided career pathway for our students. The program is specific to their self-identified skills, strengths, and passions. Our goal is to help students attain marketable skills for a successful work life. Most students are gainfully employed within three months of graduation. Skills for life. OLS students grow interpersonal skills and take steps toward greater independence. The confidence they gain at OLS, both onsite and in the community, help students self-advocate and mature so they can become productive community members. Find out more about who our students are by visiting our OLS Students page and watching our Student Testimonials videos. You can see an overview of OLS Courses on our Curriculum page.